Updated on 17 Nov 2017: Free PMP® Exam Prep Practice Test (full mock test containing 200 questions) from SimpliLearn was added; the updated list now contains 3500+ Free PMP exam practice questions. Invalid links were removed from the list. Got it? Yes, PMP is one examination where you can succeed only by getting some hands-on exercises. It is difficult to clear the examination just by reading PMBOK or attending some training. You need to try as many questions as possible, monitor your performance and control your study before going for the real PMP exam. I have touched about this approach in my earlier article titled How to Pass PMP in First Attempt?. So, the next step is to find relevant resources. You can buy question banks or mock exam softwares available in the market, if money is not a constraint. But, if you are worried about spending more money on PMP, don't worry. There are ample PMP questions available online, free of cost. In this article, I have listed some of them for your reference and use. Remember that PMP is not only Project Mangement Professional, but also stands for Practice Makes Perfect. I have not tested or reviewed the above links. So, I cannot vouch for the content provided in those links. It is up to the individuals to ensure the relevance and accuracy of the questions. However, we would welcome your feedback on those questions banks which would help other PMP aspirants to choose the better question bank for their exam preparation. Your blog is Awesome! Thanks for sharing your knowledge and experiences. Thanks Sandanuwan. Appreciate your feedback. We appreciate your knowledge sharing approach. It is helping a lot. Please visit the page PMP Tips. You may get some useful tips there. Good. Identify your shortcomings and try to improve the score. The following should be used for questions 15 through 17. A project manager is assigned to a project early in the project lifecycle. One of the things that must be done is to do a justification for the project. Since very little information is known about the project, the estimates are considered to be rough estimates. The following table is the project manager’s estimate of the cash flow that will take place over the next five years. 15. What is the payback period for this project? 16. What is the net cash flow at the end of five years? Qn. 15: The payback period is the time at which your cash flow in exceeds cash flow out. ICalculate the net cash flow at the end of each year. At the end of year 1, you have -500k. At the end of year 2, you have -290k. At the end of year 3, you have +10k. So, three years is the payback period. Qn. 17: Ans (b). NPV is always lesser than the future value. You may want to add 100 free PMP / CAPM Sample free questions from BrainBOK to your list. Thanks Harwinder for your comment. Could you please provide a direct link to the free questions?. The link to BrainBOK is added. Thanks. Thanks, Manick. I appreciate it. A quick comment - BrainBOK Mastering PMBOK Guide exam has a pool of 105 free questions from which 50 questions at a time at random. So, the total questions is 100+. It would be useful if you could update the info on your page. Harwinder, Updated the content accordingly. Thanks. Great news Sonali Bose. Wonderful! Congrats and welcome to the club! Whenever you have time, please share your lessons learned here: PMP Lessons Learned. It would be useful for others. Thanks. Good work, keep this up! JustPMP Provides an access of Online Simulated FREE one full length of PMP Practice test which consists of 200 questions and 4 hours duration. User can sign for Free PMP test at https://www.justpmp.com/pmp-test/ If you can update your page, lot of students will get benefits of it. Thanks JustPMP. A link to your free PMP Practice Test is included in the above article. Thanks a lot. This is what knowledge enhances by sharing. Thanks. Hope you find the links to PMP questions are useful. Highly recommend http://pmpexamforfree.com to everyone taking PMP exam. 700+ realistic questions and totally free with no registration. Thanks James for your recommendation. 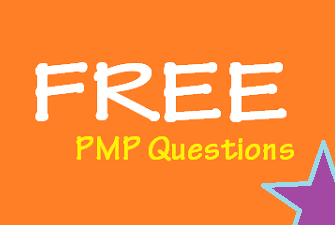 Now, I have included a link to the PMP test questions from PMPExamForFree. I have a question: I need to buy PMP questions? I am not sure what do you mean. The above list shows you links to free PMP questions. If you would like to buy, there are other sources. One of the more popular one is Rita Mulcahy's database of PMP questions. hi Guys, I am preparing for the PMP and found this webpage today and starting doing the practices. Earlier i was doing tests from overseas sites like in india mainly. Those sites tend to ask ambigious questions just so you score low and think you're not ready for the PMP. questions from internet or somewhere unrelated. I think their purpose is to make you buy their materials and exams only! I am currently studying for my CAPM qualification before I move onto my PMP, I see the links provided above in the blog refer to PMP only are there any useful practice tests centered around CAPM? Thanks for sharing such information!! Thanks Manick for such list of practice questions really very informative. I find this article very useful, thanks I found it before my pmp exam. I am preparing and planned to write on 12th Dec'17, will share my knowledge and experience after my passing of exam with God grace. Good to know that the links to various PMP question banks are useful to you. Please share your feedback on the questions. My best wishes to you. You will be a super star on 12/12/17. Your company policy allows accepting gifts from customer within certain limit. Your customer is giving you a gift which is beyond limit of your company policy. You have given a gift to the customer's representative already which has similar in value. What should you do? I am confused between 3 and 4. I think it should be 4. Refuse it as the we know the company's policy. The answer should be (4). The company policy is clear; hence, you should refuse it. There is no point in contacting your senior management. Shouldn't the answer be 3. Contact your Company's senior management, because you have alreade given a gift of similar value to the customer's representative? No, I don't think so. Since you were offered a gift "which is beyond limit of your company policy", you should not accept it. PMI expects PMs to be independent and in very rare cases, you are expected to approach senior management for advice and support. Many thanks for detailed info. Much appreciated. Are you looking for an authentic and updated exam preparation material for your PMI PMP Dumps? Just try Dumps4free PMI PMP Exam Dumps. By preparing these PMP Free Dumps Questions Answers and PMI PMP Dumps Questions, you would not require any other resource for preparation. You can obtain PMI PMP Free braindumps in PDF as well as in exam engine format also. Get free PMI PPMP Dumps PDF demo to check the quality and correctness of our study material.